Green Field Enterprise Web GIS Implementation at EnerVest - Value Created and Lessons Learned. Bill Keller led this session by highlighting the value of Enterprise GIS and the role LOGIC played in making it happen. We had lots of cool swag but the crowd favorite (by far) was the LOGIC t-shirts –they went like hot cakes. Thursday, April 7th was the 2017 FME World Tour in Houston. Safe Software’s yearly road trip aims to promote and educate on the FME platform. We’ve been looking forward to the 2017 edition since last year’s FME WT! In addition to the LOGICians there (thanks Lisa), it was great to see so many local energy firms in attendance. 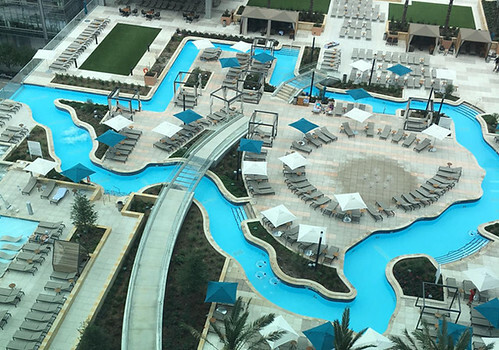 Here are some of our observations from the 2017 FME World Tour Houston. 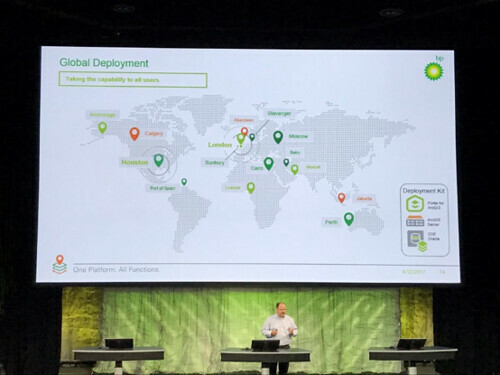 FME is such a powerful tool for ETL (Extract > Transform > Load), data enrichment and data conflation for oil and gas companies, so I was happy to hear Safe Software is continuing to invest in their tool by growing the number of out-of-the-box connectors. They are also updating their already solid user interfaces, including the FME Server experience. Safe Software continues to build upon the community aspect of FME through interactive and fun learning opportunities. This year, they asked folks to huddle into teams to answer technical questions in the hope of winning swag – something all conference attendees (including myself) love. This activity definitely got everyone engaged and thinking about FME. The LOGIC team came home with a few topics to brainstorm. This week we’ll be presenting a paper at the 2017 Esri Petroleum GIS Conference, focusing on an FME implementation with our client, EnerVest. The Green Field Enterprise Web GIS Implementation at EnerVest allowed the GIS team to automate data downloading, cleanup, conflation, spatialization and loading into ArcSDE. This type of FME engagement helps oil and gas companies focus on finding or producing oil and gas instead of manual data massaging or script writing. 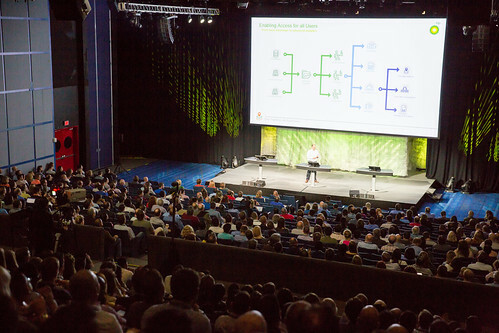 If you haven’t been to an FME World Tour, make plans to join us next year, the event and accompanying community are awesome. Going forward, we have plans to continue utilizing and promoting FME as a powerful (and cost effective) ETL platform. Please let us know if you have any related FME questions. and I must admit, I found the conference to be an amazing experience. Palm Springs is the best place to hold a conference in March. Such beautiful weather and views, I was sad to leave. 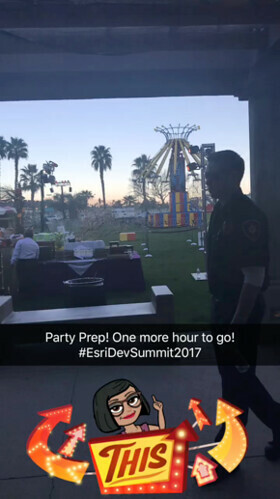 This was my first time attending the Dev Summit as a software user and the agenda did not disappoint. Even though I went to the conference with a predetermined set of favorited sessions in the Esri Events app, I did quite a bit of rearranging after watching the plenary on Tuesday, March 7 and then the keynote on Wednesday, March 8. There were several Internet of Things (IoT) based technical sessions. These sessions presented everything IoT, from the smallest known computer: Raspberry Pi to Arduino like microcontrollers. I was amazed by the amount of work the Esri Prototype lab has accomplished and the wide range of implementations using various gadgets. Nice job team! Exploring Virtual Reality (VR) with ArcGIS: Rex Hansen, Pascal Mueller and Adrien Meriaux presented this Esri Technical Session where there were several demos and walkthroughs of how to create 3D content and experiences for GIS data. I was completely blown away by the live demos, one of my favorites was the Esri HoloMaps. Although the bean bag chairs were deeply missed this year, the loungers with power plugs were very popular. I never once found an empty chair. 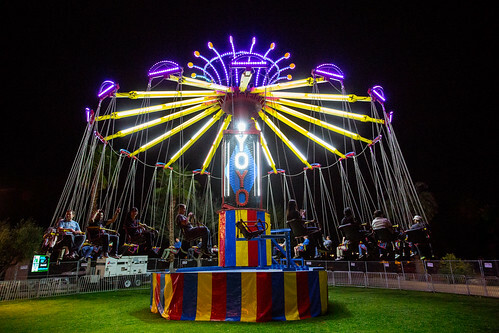 Throw carnival in the mix of a dodgeball game, you only get some fun times. So many games and a couple of fun rides before the dodgeball tournament made for an exhausting conference, but I’m ready to go back next year! I must give kudos to the Esri Events app. The app let me filter and categorize sessions based on technology, expertise levels, room or location of the sessions among other things. It also let me take notes which I later emailed and shared with colleagues. I could type and sync notes from my laptop, iPad or iPhone and not miss out on anything. I was disappointed in the food at the conference. Very limited meatless options (cold wraps, salads or fruits). Next time, I plan to stock myself up with bars and other snacks. Walking an average of 6-7 miles from 8 am-8 pm everyday requires major fuel. Also, I was surprised that the lunch area didn’t feature more umbrellas since the Palm Springs’ sun was shining bright. The events team did try to help by walking around handing out sunscreen packets and reminding you to put the sunscreen on. However, a little more shade would have made lunching outside more enjoyable. There was a lot going on at the conference simultaneously. I ran around attending as many sessions as possible and could only catch about 20% of the conference due to overlapping sessions. This is not necessarily a bad thing but I did have a tough time getting over my fear of missing out, #FOMO. I am working on my list of 20 remaining sessions by going over the videos and slides as they are added to the Esri Event's You Tube channel. Below is my personal gallery of photos captured. Enjoy! The mini case studies are aimed at providing insight into the business and technical challenges facing your peers, the industry and our team. Each one will highlight the challenge, the solution, current project status and any realized benefits. We’ll be covering the updates on the blog. Keep an eye out and reach out with any questions. is Esri's technology for accessing and managing geospatial data within relational databases. ArcSDE geodatabases allow you to use other Esri products, such as ArcGIS Desktop and ArcGIS Server, as well as custom applications to store, use, and manage all your GIS data in one database management system. Recently our team led a global ArcSDE upgrade effort for a major oil and gas company. Over the course of the project, our team worked with dozens of offices around the world to remotely upgrade and test the involved databases using a mix of scripts and test plans. As a result of collaborative planning and clear communication, the upgrade was completed with no hiccups or unexpected issues. Our client quickly regained use of ArcSDE to fulfill day-to-day needs with some additional features delivered by the upgrade. Our client manages an enormous amount of data. Ingesting, synthesizing and distributing data are the responsibilities of the Data Management team. Our team worked with the client to understand their goals, systems and data functions. Enter Safe Software’s FME, which allows for the automated flow of data between applications. 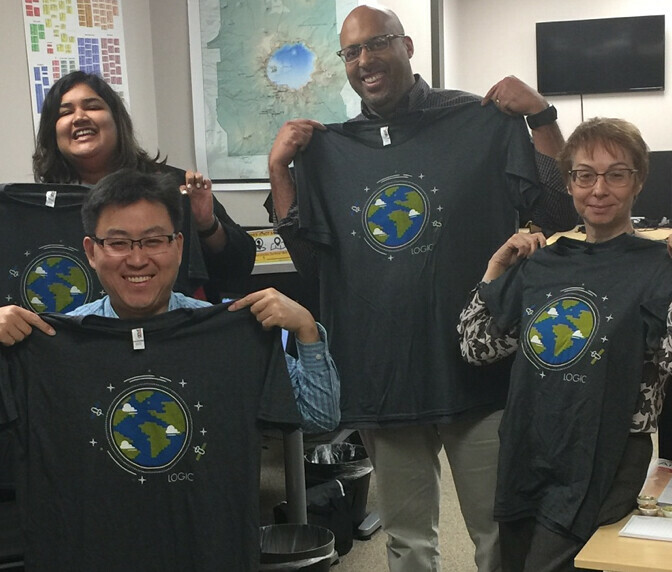 From there, we helped them build out a robust Extract, Transform and Load architecture that leverages Esri’s ArcGIS Platform, Python, SQL and FME suite in order to meet their daily data needs. The development of spatial data management workflows has allowed the large E&P to automate many data transfers, improve quality and enrich data for improved business function. The workflows are taking care of those data tasks we all face each day and is still operating while the team gets some much needed sleep – we are talking lifesaver status! This project included the need to optimize a smaller Portal for AcrGIS environment, and to provide a custom Portal Theme with an advanced selection and filtering tool. The result was a solution which stabilizes and adds advanced features to Esri Table Control, giving it more functional power. The custom Esri Theme allows our client to easily spin up new Web Applications via Web AppBuilder. The LOGIC team led a geospatial data management assessment for an international integrated Super Major. The project began by analyzing the current spatial and related data management environment and resulted in providing a roadmap to move their GIS efforts forward. The main focus of the assessment was Upstream, however with any comprehensive roadmap, Midstream and Downstream were taken into account. Here are a few highlights of the strategic assessment areas that were addressed. A detailed implementation roadmap including timeline and budget were delivered at the completion of the assessment. Please contact LOGIC today for further questions on any of the projects mentioned. Recently I attended the Houston Energy Forum presented by Tibco, which focused onTibco Spotfire and Tibco OpenSpirit technology suites. To be honest I haven’t felt so jazzed about technology in a while. (Keyhole Markup Language) out of the gate.